Item284 - Pakington 4. Victoria District. Plan of Pakington & Lynton Townsites showing Hutt Lagoon, Port Gregory, Hutt River & various lots in vicinity. By A.C. Gregory Fieldbook 25 dated 1853-1954 (Later additions) [scale: 30 chains to an inch]. Item285 - Parkerville 85. Plan of Parkerville Township showing various Lots North & South of Mahogany Creek. South of Richardson Road (unsigned and undated) [scale: 10 chains to an inch]. Item286 - Parkerville 85/1. Plan of Parkerville Township showing various lots between Richardson Road & Eastern Railway line & Falls Road East to Granite Rd. Vicinity of Jane Brook. Lots by T. Beasley 1899. Lot by A.J. Bennett and later additions [scale: 40 chains to an inch]. Item287 - Parkerville 85/2. Plan of Parkerville Townsite showing Lots 77-82 inc., 84, 87-93 inc. by T. Beasley Fieldbook 60 dated 1899 (vicinity of Richardson & Falls Roads & Eastern Railway line) [scale: 40 chains to an inch]. Item 288 - Perth 18. Plan from actual survey of Township of Perth showing Lots, Streets & Lakes bounded by Perth Water to South, Ellen Street to North, Mt Eliza to West & Swan River & Hierrisson Island to East. Drawn by A. C. Hillman, 1838 [scale: 10 chains to an inch]. Confirm Item Request: Perth 18. 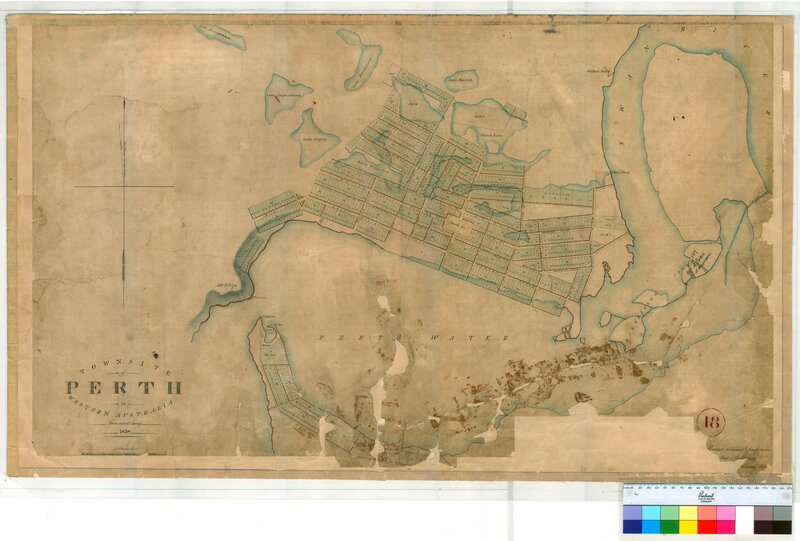 Plan from actual survey of Township of Perth showing Lots, Streets & Lakes bounded by Perth Water to South, Ellen Street to North, Mt Eliza to West & Swan River & Hierrisson Island to East. Drawn by A. C. Hillman, 1838 [scale: 10 chains to an inch].